We have now reached the fourth installment of our Important Parts of a Rolex Watch series. After delving into the Rolex cases, Rolex movements, and Rolex bezels, we are now taking an in-depth look at the Rolex bracelets, straps, and clasps. In the early days of men’s wristwatches, timepieces almost always were attached to the wrist via a leather strap. To upgrade a watch with a metal bracelet was a costly affair. As we’ve mentioned a few times over the course of this series, it was common for luxury watch brands to depend on outside suppliers to make certain watch components, whether it was movements, dials, or other parts that make up a timepiece. And Rolex, like many other top watchmakers of the era, sourced most of their metal bracelets from famed bracelet maker, Gay Frères. Gay Frères produced bracelets for Rolex in the 1930s and 1940s including—among others—the famed Bonklip bracelet, sometimes also called the Bamboo style bracelet. Aside from the modern and robust design of the Bonklip, the bracelet was also appealing for its ability to extend, thus able to fit a range of wrist sizes very comfortably. The design of the Gay Frères metal bands produced for Rolex was the pre-cursor of now-iconic Oyster bracelet. In 1998, Rolex outright purchased Gay Frères, emphasizing the watchmaker’s focus on vertical integration. What sets Rolex apart as a watchmaker is the brand’s incredible attention to detail and an obsession with improvement. The company has an uncanny ability to enhance and upgrade every aspect of the watch while still maintaining fundamental design details. It is clear that Rolex takes this approach with their bracelets—modern versions are similar in style to their vintage counterparts, yet boast enhanced engineering. As stated above, like all other high-end watch brands during that era, Rolex wristwatches made in the early part of the 20th century came fitted with leather straps. However, as we will soon discover, metal bracelets became Rolex’s favored watch band style from the middle of the last century and continues to be today. These days, Rolex offers leather bands sparingly, on a few select Day-Date, Sky-Dweller, and Daytona models, as well as within the Cellini collection. However, it is worth noting that leather straps are a popular option in the Rolex enthusiast community with many collectors fitting their own Rolex timepieces with leather bands. In 1945, Rolex unveiled the Datejust watch, which as its name suggests, included a date window on the dial. However, along with being the world’s first automatic chronometer wristwatch with a date feature, the Datejust also came fitted with a bracelet created specifically for the watch—aptly called the Jubilee bracelet. Characterized by its five-piece link design, the Jubilee bracelet is now available in a variety of metals ranging from steel to gold to two-tone combination of steel and gold. However, when it was first released, it was only made in gold. Since it adds a more formal touch to the watch, the Jubilee bracelet has mostly remained as an option in the Datejust collection of dress watches. However, since the late 1950s, the GMT-Master is the only Rolex sports watch that is also available with the Jubilee bracelet. The Jubilee bracelet is fitted with an Oysterclasp or a Crownclasp. The style of the Jubilee bracelet links has changed over the years, but they can be categorized into four main styles and there’s an interesting design detail to note depending on where the bracelets were made. Swiss-made Jubilee bracelets until 1974 had folded-style links while those made in the USA or Mexico (more on that later) during the same time had oval-style links. These were eventually replaced by D-style links in the mid 1970s, finally followed by the solid-style link in the mid 2000s. Patented in 1947 and introduced in 1948, the Oyster bracelet is the most widespread and versatile Rolex band style to date. In fact, it is available across almost all Rolex watch collections, it is made in all of Rolex’s offered metals, and it can be fitted with the Oysterclasp, Oysterlock, and Crownclasp clasps. Over the course of the last 70 years, the Oyster bracelet underwent plenty of modifications, while staying true to its essential flat three-link design. In general, Oyster bracelets are categorized into three generations. The Rolex President bracelet is the perfect illustration of how integral the band design is to the overall essence of a particular model. After all, the Day-Date, which is the watch that the President bracelet made its debut on in 1956, is more commonly known as the Rolex President watch. Featuring a three-piece semi-circular link design, the President bracelet has always exclusively been made in precious metals, namely gold and platinum. Rolex has also applied some interesting decorative techniques to the President bracelet in the past. For instance, there are the President bracelets with textured bark-like center links. There are also the Tridor President bracelets, which combine three shade of gold in one. And of course, diamond Rolex President bracelets are always a popular choice. When Rolex introduced the Oysterquartz collection in 1977, it was not just the quartz movement inside the watch that was vastly different than other Rolex watches. The angular case shape and integrated bracelets were also unique to the collection. While the Oysterquartz watches relied on the general style of the three main Rolex bracelets—Oyster, Jubilee, and President—the bracelets were integrated into the case, creating a look that was completely on-trend in the 1970s. Depending on the model, the Oysterquartz Datejust watches were made available with steel Oyster-style integrated bracelets, steel Jubilee-style integrated bracelets, or two-tone steel and yellow gold Jubilee-style integrated bracelets. On the other hand, the Oysterquartz Day-Date watches were fitted with either a white or yellow gold President-style integrated bracelet, a yellow gold Pyramid integrated bracelet, or a yellow gold Karat integrated bracelet. In 1992, Rolex presented a brand new women’s watch called the Pearlmaster, which was named after its band, the Pearlmaster bracelet. Part of an ultra-lavish Rolex jewelry watch, the Pearlmaster bracelet is designed with rounded five-piece links, is always crafted in 18k gold or 950 platinum, and is fitted with the Crownclasp clasp. In addition to the Pearlmaster watch, the Pearlmaster bracelet was also used on special-edition Day-Date Masterpiece watches for men. In 2015, Rolex unveiled the Everose Yacht-Master with a brand new band called the Oysterflex bracelet. This is Rolex’s patented approach to a rubber watch strap that includes a titanium and nickel metal blade covered in black elastomer. Plus, for optimal comfort, the underside of the Oysterflex includes fin-like details to raise the band above the wrist for better airflow. Fitted with an Oysterlock safety clasp, the Oysterflex bracelet is currently only available on select Yacht-Master and Daytona models. While today’s Rolex Cellini watches all come with leather straps (post-2014), older and vintage models sometimes included some very intricate gold bracelets that look like jewelry pieces. Some noteworthy Cellini band styles include mesh bracelets, bead-style bracelets, brick-link style bracelets, Bonklip bracelets, braided-style bracelets, and integrated-style bracelets. 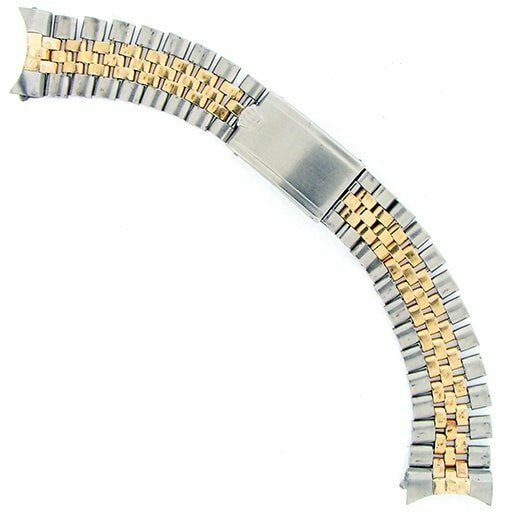 In addition to the bracelet link style, the end links, also known as end pieces, of the Rolex bracelet plays an important role. Rolex end links have gone through their own evolution over the years. For instance, early Rolex metal bracelets included straight ends until the 1950s, when the now-signature end-links were designed to hug the case tight for a seamless flow between case and bracelet. These end links were first hollow and are therefore lighter and some may say, more flimsy than their modern counterparts. Rolex introduced the solid end links on the Sea-Dweller in the mid-1970s and eventually rolled out the solid end links (aka SEL) across all models. Today, all modern Rolex watches have SELs, giving a much sturdier and heftier feel to the bracelet. In order to save on taxes, Rolex began producing bracelets in North America starting in the late-1950s until about the mid-1970s. 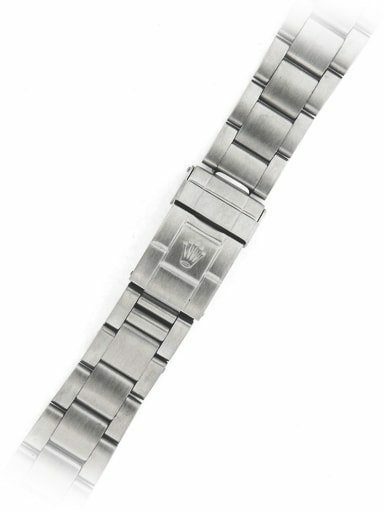 The USA-made riveted Oyster bracelets were made by C&I and include a few key markings such as the C&I logo, Rolex stamp, Rolex coronet, and date stamps. On the other hand, USA-made Jubilee bracelets were produced by a few different manufacturers and these are characterized by the oval shape of the links (compared to the folded links of the Swiss-made Jubilee bracelets). Mexican-made Oyster and Jubilee bracelets include “Hecho en Mexico” markings on the claps and like the USA-made ones, the Jubilee links are oval in shape. A crucial component to a watch bracelet is how it closes shut to secure itself to the wrist. Naturally, Rolex has produced several clasp styles over the years and some even come with built-in extension systems. Older versions of the Rolex clasp have always been a point of debate amongst Rolex collectors. Some appreciate the classic lightweight feel of the simple stamped “tuna-can clasp” and the way it rattles, while others have always maintained that the flip clasp was the one area that Rolex seemed to overlook. Sometime in the mid-2000s, Rolex began making newly engineered clasps to accommodate the new solid bracelets. It’s important to note that throughout the years, Rolex used different styles of claps for the same type of bracelet. What’s more, markings inside the clasps also evolved over the years including different styles of Rolex logos. There can also be the country of origin (e.g. Swiss, USA, Mexico) as well as a hallmark to indicate the material used (e.g. Steelinox for steel, 750 for 18k gold, and so on). Markings can also include the bracelet code/reference number. Sometimes, post-1975, there are also clasp codes that include letters and numbers (the letter represents a year and the number corresponds to the month) that can give some insight on production dates. The simplest among Rolex clasps and typically reserved for non-Professional models, the Oysterclasp is a folding deployant clasp with the Rolex crown embossed on it that opens by using a lever mechanism. The Oysterlock is also a folding deployant clasp but it comes with an added cover lock mechanism that is opened by lifting the Rolex crown detail on the end of the clasp. As a more durable and robust clasp, this is the one you’ll find on Professional models such as the Daytona, Submariner, GMT-Master, and Yacht-Master. Available on the Pearlmaster, President, Jubilee and select Oyster bracelets, the Crownclasp features a Rolex crown-shaped lever that hides away the folding blades under it. In 2013, Rolex introduced a special version of the Crownclasp for leather straps equipped with a folding clasp that permits the wearer to adjust the length of the strap. 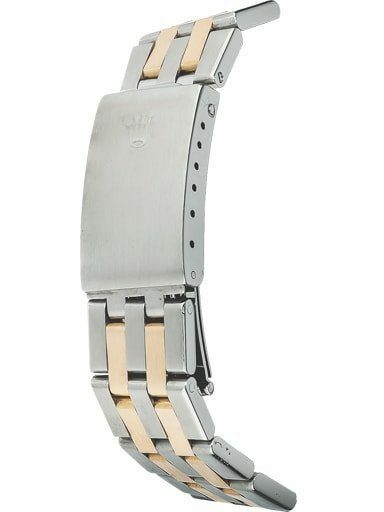 Rolex patented the Easylink extension system in 1996 to allow the bracelet to extend or shorten by about 5 mm. Tucked underneath the clasp, the Easylink works by including a link that can either be pulled out to make the bracelet longer or folded back to reduce the length of the bracelet. The Glidelock mechanism allows the bracelets of Rolex dive watches to extend in increments of 2 mm to a total of 20 mm. Thanks to its clever toothed panel located under the clasp cover, the Glidelock system means that the Submariner, Sea-Dweller, or Deepsea can easily fit over a wetsuit. For the ultra-robust Sea-Dweller and Deepsea dive watches, Rolex added a Fliplock extension in addition to the Glidelock. The Fliplock foldout link allows the bracelet to extend by an additional 26 mm to accommodate very thick diving suits.